As mentioned previously, I was and just finished reading Born to Run by Christopher McDougall. This is not my first book on sports and health, but it is my first book about running and one that I enjoyed. Though I find the sometime-meandering path and narrative McDougall laid out a bit tedious at times, there was still much to take from it. Of course, in hindsight, McDougall's approach made sense. Constantly, I was thinking in the back of my mind, "Tell me how they did it!" And just as I thought I would get the answer, the book trailed off down other paths. I realized that it was in part a representation of the story he was telling about the nature of running. The impatient American mind (me) wants the "answer" (as if there was one singular clear answer) in a nice clean box and not have to hear about all these other things such as past races, the people involved, etc. Indeed, McDougall's pacing was overall agreeable and interesting as he shifted back and forth between discussing some of the greatest ultra-marathon runners in the world, the coming together of some of the world's greatest runners in a race with the Tarahumara, and exploring the evolutionary biology that underpins humans ability to run serious distances. McDougall is also great with his scene-setting and race descriptions. Despite some of these races being some 15 years or older, his proses puts the reader right into the event. 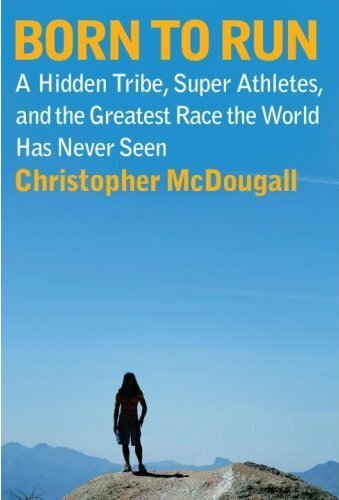 At the core of his book, McDougall illustrates that we have drifted from fully understanding our body's abilities as they pertain to running and more improtantly, the necessity of our feet to be more connected to the ground in order for them to better report and our bodies better adjust to how moving on our legs impacts our entire body. Without honest feedback from our feet about the impact of each step, the rest of our body cannot properly adjust. The high end shoes block pain but not impact and pain is a feedback system that helps us move our bodies in more appropriate ways. The book gave me ample insights and helped me better understand why I was able to enjoy running for the first time in my life. It helped me accomplish what I thought would have been impossible 1.5 years ago and encourages me to try for even further distances. I would recommend the book to anyone flirting with trying to run or starting to run. I think there's a lot of potential to harness for neophytes like myself. I also think that more traditional runners might be intrigued by the ideas that McDougall offers.